January 21, 2013. It’s hard to believe that it has already been a week since the three of us landed here in Leogane, Haiti. Even though just last Saturday we were at home in the US, the sounds of the early morning clatter here at camp and the moto horns blaring on the nearby road seem normal. Our week has been packed with morning sessions with the coaches followed by afternoons playing with the kids at the 4 GOALS Haiti sites (www.goalshaiti.org). Every morning here we gather for a brief meeting with 15-20 coaches about the day’s games and what we learned at the session prior. The coaches have really committed to the messages about conflict resolution, gender equity, health and wellness, and skills for life. A lot of it has been an on-field discussion about how GOALS Haiti coaches can make a bigger impact through their roles as mentors and coaches for the kids here in Leogane. 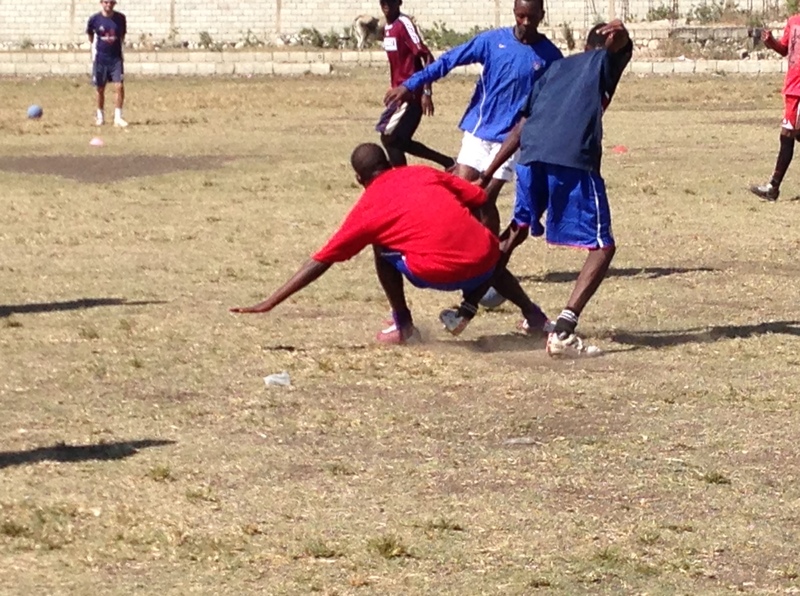 The level of soccer here is competitive. With or without shoes, boys and girls dazzle with their grit and share of flashy moves. In the first week we’ve taught more than 20 games during which the coaches have learned the difference between coaching soccer and coaching soccer for social impact. The GOALS coaches play a large role in the kids’ lives, and the games they are learning from Coaches Across Continents are helping to make their influence a hugely positive one. The biggest compliment the CaC team received was passing by the soccer fields and seeing that the GOALS coaches have already chosen on their own to use the games they’ve learned in the morning sessions during their afternoon practices with the kids. These games do more than just build soccer skill; they teach the kids and coaches life and thinking skills. One coach, Gatuso, told Nick, “You have given me my brain”. Gatuso, along with other coaches, appreciate and enjoy that the games stimulate their problem solving skills, creative and responsible thinking, as well as teach lessons that are much more fun to talk about on the field than in the classroom. On friday, the coaches taught the group of Adebayor against HIV games, including Condom Tag, Can You See HIV?, and other games that encourage making smart choices to avoid the virus. This session had a real impact on the coaches and opened their eyes to the ways in which they can have these types of educational conversations on the field in a fun and safe setting. Yesterday, Cheta and Marie got the chance to sit in on Jolinda’s English class with one of GOALS Haiti girl groups. It was fun being able to ask questions of them and vice versa, singing silly songs, and reviewing past lessons. Our favorite song of all was “I Like Chicken” during which the girls yelled “I LIKE CHICKEN! I LIKE CHICKEN! YES I DO, YES I DO! DO YOU LIKE IT?” over and over again. Don’t be fooled by the lyrics, the tune was super catchy. In other musical news, the local coaches have added “Barbie Girl” to the long list of nicknames they have for Marie. With Nick and Jolinda’s encouragement they began singing “I’m A Barbie Girl” to Marie during Fridays session. Cheta primarily goes by “Sauce” or “Chantel” while Marie is typically called “Bubbs” or “Rice”….get it? Sauce and Rice? The accommodations here are very nice, wooden huts, outdoor showers and electricity for parts of the day and Jolinda and Kona are taking good care of us. Except for the spider the size of Nick’s head in Marie and Cheta’s bunk house last night, everything is clean and very pleasant here at camp. The devastation and poverty in Haiti is heartbreaking of course, but the country itself is beautiful, the kids and coaches are awesome, and Nick’s immature jokes and fun games are keeping them all entertained and learning. We will be very sad to leave this place and these people in a week’s time. See you back in the states then! 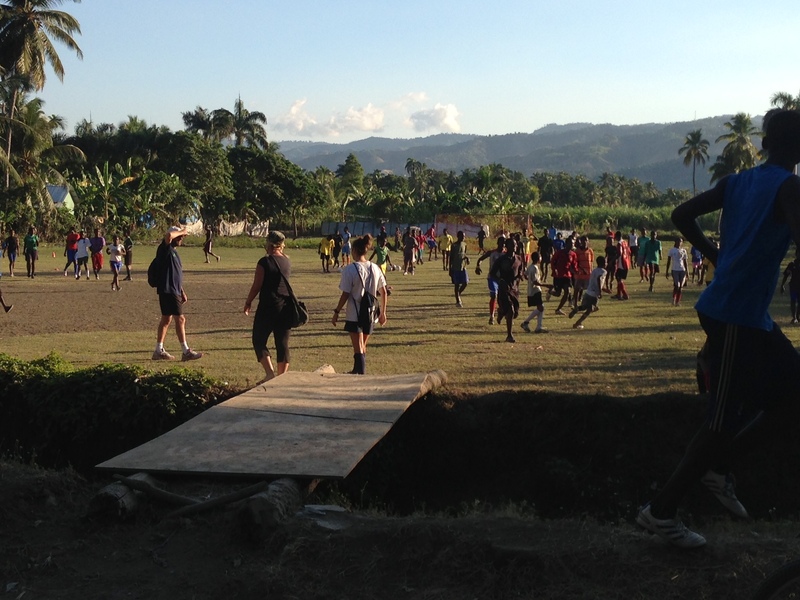 Previous: Meet the Coaches – Haiti Edition! Next: Introducing the Community Impact Coach Program!